All in all, it was a good night for the Aussies: Russell Crowe won his Golden Globe for Best Actor – Drama for A Beautiful Mind, Baz Luhrmann's Moulin Rouge triumphed as Best Musical or Comedy and was good for a Best Actress – Comedy Globe for Nicole Kidman as well. 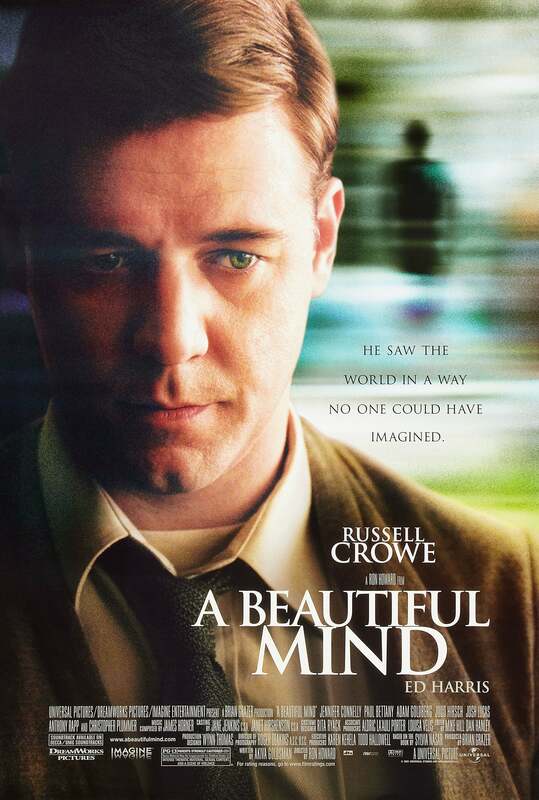 Directed by Ron Howard, A Beautiful Mind tells the story of Princeton mathematician John Nash (Crowe), who won a Nobel Prize for Economics after years of struggling with schizophrenia. Jennifer Connelly plays his very supportive wife Alicia. The film won four Golden Globes: Film, Actors (Crowe and Connelly as Best Supporting Actress) and Best Script (Akiva Goldsman). The Golden Globe Awards ceremony, on January 20, 2002, was the first one taking place after 9/11/2001. The event was held behind a larger than normal security cordon. Once inside, it was business as usual. Stars, moguls and their entourages paraded down a camera-lined red carpet along the hotel's entry drive amid flashbulbs and spotlights. Everything went smoothly. Crowe won the Globe for A Beautiful Mind, but not the Academy Award (where he was nominated): it was a reverse result than the previous year when he won the Oscar for Gladiator but not the Globe. With A Beautiful Mind, Crowe won the Globe over Denzel Washington (Training Day), Billy Bob Thornton (The Man Who Wasn't There), Kevin Spacey (The Shipping News) and Will Smith (Ali). The other films for Dramas nominated at the Globes in 2002 were The Lord of the Rings: The Fellowship of the Ring, The Man Who Wasn't There, Mulholland Dr. and In The Bedroom. Ron Howard was also nominated as Best Director, but Robert Altman won for Gosford Park, a film nominated in the Comedy section. John Nash visited the set, and Russell Crowe said later that he had been fascinated by the way he moved his hands, which he tried to imitate in the movie to get into character. The scene towards the end of the film where Nash contemplates drinking tea is based on a true event when Crowe met the real John Nash, who spent fifteen minutes contemplating whether to drink tea or coffee. In a tragic twist of fate, John and Alicia Nash were killed in a car accident on May 23, 2015: they were passengers in a taxicab whose driver lost control of the vehicle in New York. Nash was always afraid of speeding cars. 2002 - Musical or Comedy: Moulin Rouge!